This is the largest gold nugget in the world its called “The Hand of Faith”. 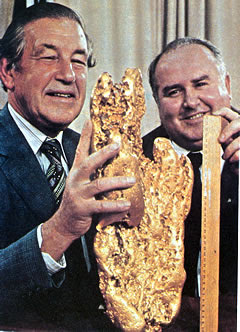 It was found by Kevin Hillier using a metal detector in Victoria, Australia in 1980. Mr Hillier almost didn’t dig it up thinking his metal detector was defective. 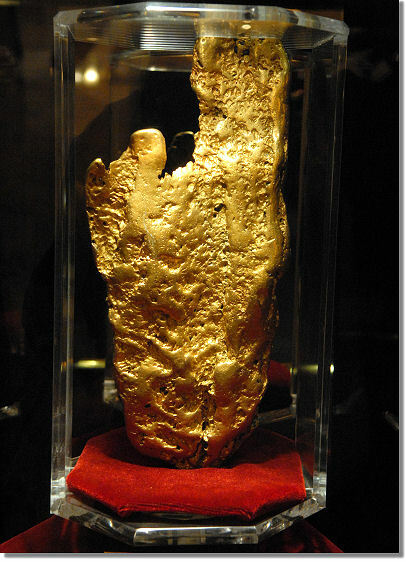 It weighs 27.21 kg or 72 pounds and was sold to the Golden Nugget Casino in Las Vegas for 1 million dollars and is currently on display there.